I didn’t blog yesterday because I was sad. It happens. I was talking to a friend about this article. I don’t do mushrooms because they make me sick but ya, it is an interesting thing to think about. On a summer morning in 2013, Octavian Mihai entered a softly lit room furnished with a small statue of Buddha, a box of tissues and a single red rose. From an earthenware chalice, he swallowed a capsule of psilocybin, an ingredient found in hallucinogenic mushrooms. Then he put on an eye mask and headphones and lay down on a couch. Soon, images flew by like shooting stars: a spinning world that looked like a blue-green chessboard; himself on a stretcher in front of a hospital; his parents, gazing at him with aching sadness as he reached out to them, suffused with childlike love. 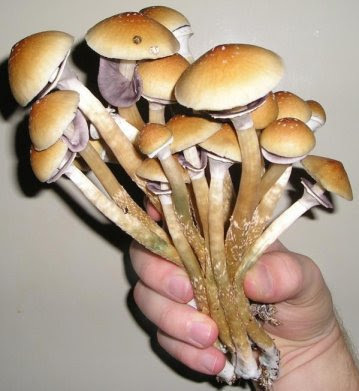 Psilocybin has been illegal in the United States for more than 40 years. But Mr. Mihai, who had just finished treatment for Stage 3 Hodgkin’s lymphoma, was participating in a study looking at whether the drug can reduce anxiety and depression in cancer patients. Throughout that eight-hour session, a psychiatrist and a social worker from NYU Langone Medical Center stayed by his side. Published Thursday, the results from that study, and a similar small, controlled trial, were striking. About 80 percent of cancer patients showed clinically significant reductions in both psychological disorders, a response sustained some seven months after the single dose. Side effects were minimal. In both trials, the intensity of the mystical experience described by patients correlated with the degree to which their depression and anxiety decreased. The studies, by researchers at New York University, with 29 patients, and at Johns Hopkins University, with 51, were released concurrently in The Journal of Psychopharmacology. They proceeded after arduous review by regulators and are the largest and most meticulous among a handful of trials to explore the possible therapeutic benefit of psilocybin. Although cancer patients will not have access to therapeutically administered psilocybin anytime soon, the findings add vigor to applications to expand research in a multicenter trial with hundreds of participants. Psilocybin trials are underway in the United States and Europe for alcoholism, tobacco addiction and treatment-resistant depression. Other hallucinogens are also being studied for clinical application. This week, the Food and Drug Administration approved a large-scale trial investigating MDMA, the illegal party drug better known as Ecstasy, for post-traumatic stress disorder. Cancer-related psychological distress, which afflicts up to 40 percent of patients, can be resistant to conventional therapy. Mr. Mihai’s anxiety began when doctors finally told him he was in remission. He would keep touching the nodules on his neck, where the cancer had announced itself. He flew to Europe to celebrate the end of treatment and his graduation from college, but abruptly returned to New York, terrified to be away from oncologists. He began drinking daily, hard, jeopardizing his fragile health. Alarmed, doctors suggested the psilocybin study. “Why are you letting yourself be terrorized by cancer coming back? This is dumb. It’s in your power to get rid of the fear,” he told himself. “That’s when I saw black smoke rising from my body. And it felt great. Is The New ‘Fantasy’ Art Reactionary or Just Bad?